The SCS Global LWA strengthens civil society and independent media organizations around the world and infuses participatory approaches, social inclusion, transparency and accountability principles in all development sectors. Integrate participatory approaches, social inclusion, transparency, and accountability in all sectors. Develop advocacy strategies to anticipate and counter government arguments premised on inaccurate characterizations of FATF’s revised standards. Civic I.D.E.A. Youth Media Literacy Toolkit — Emerson College’s Engagement Lab is working with SCS Global to develop a Civic I.D.E.A. Media Literacy Toolkit, which will provide a program for facilitators to build capacity of youth to inform themselves, think critically, and take civic action online. The Civic I.D.E.A. 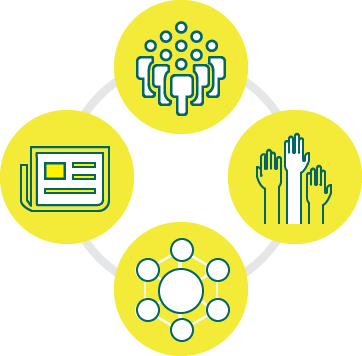 Framework is designed to help youth move from the point of critical inquiry to practicing media literacy that prioritizes active engagement and participation in daily civic life. Civil Society CVE Programming Reference Guide — FHI 360 is producing a reference guide for local civil society organizations designing and implementing programs to prevent or counter violent extremism (CVE) in their communities. The guide will consolidate relevant resources and tools that can assist civil society organizations in different stages of their work in preventing or countering violent extremism. Youth Programming Self Assessment (YPSA) Tool for Youth-Serving Organizations — FHI 360 is finalizing a tool which will support youth-serving civil society organizations (YSOs) in reflecting on their own practices, evaluating how their programming performs against best practices in youth programming, and identifying areas of improvement. The YPSA tool can complement commonly used organizational capacity assessments that focus on institutional capacities to focus specifically on YSOs’ implementation of youth programming best practices. The tool will include the Youth Programming Self-Assessment, a youth feedback form, a YPSA overview and directions for the assessment, and a facilitator guide.